The TRUE history of Tulum, not the fairy tales the tour guides make up. Includes all the text of my previous book. 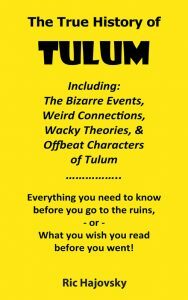 “TULUM; Everything you need to know before you go to the ruins,” PLUS twice as much more information about the pre-Conquest Maya and the later Maya Cruzoob Rebels who made Tulum their base. Descriptions of how the Maya calendar worked, Maya sacrificial rituals, the history of Gonzalo Guerrero, the bizarre events, wacky theories, and offbeat characters of Tulum, as well as a map and building by building description of the site. This is the book you will wish you read before you went to Tulum!